Titan—Saturn’s largest moon—is remarkable in that it features a dense atmosphere and stable liquid at the surface. The only other place in the solar system with these particular characteristics is, you guessed it, Earth. Thanks to a pair of new studies, we can add a third trait to this list of shared characteristics: a global sea level. Two new studies published in Geophysical Research Letters are offering fresh insights into one of the solar system’s most intriguing objects, the Saturnian moon Titan. The first study provides the most detailed topographical map of Titan to date, while the second study piggybacks off this research, showing that Titan’s largest seas and lakes have a common equipotential surface, meaning they form a common sea level. Both studies were done by researchers from Cornell University in Ithaca, New York. Using data from multiple sources, including the late, great Cassini probe, a research team led by Alex Hayes was able to piece together the new topographical map. It’s not perfect (it still has some gaps and “hazy” areas of uncertainty), but it’s the most detailed yet. The exercise, which took a full year, revealed some new features, including new mountains (none higher than 2,290 feet (700 metres)) and depressions in equatorial regions that appear to be either ancient, dried seas or cryovolcanic flows (that is, flows produced by ice volcanoes). The Cornell scientists also learned that Titan is more oblate—or flatter—than we thought, which means it has a crust that’s highly variable. In the second study, also led by Hayes, the researchers used the new topographical information to show that an average sea level exists across Titan’s seas and lakes. 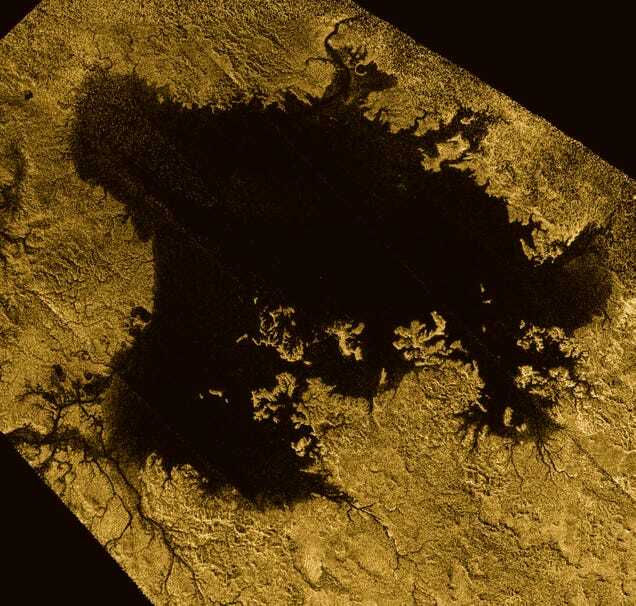 Unlike Earth’s oceans of liquid water, however, Titan features water bodies of oily hydrocarbons (e.g. liquid methane and ethane). Titan’s largest seas and lakes were shown to rest at a consistent elevation across the planet, similar to how the Atlantic and Pacific oceans sit at a common sea level on Earth. 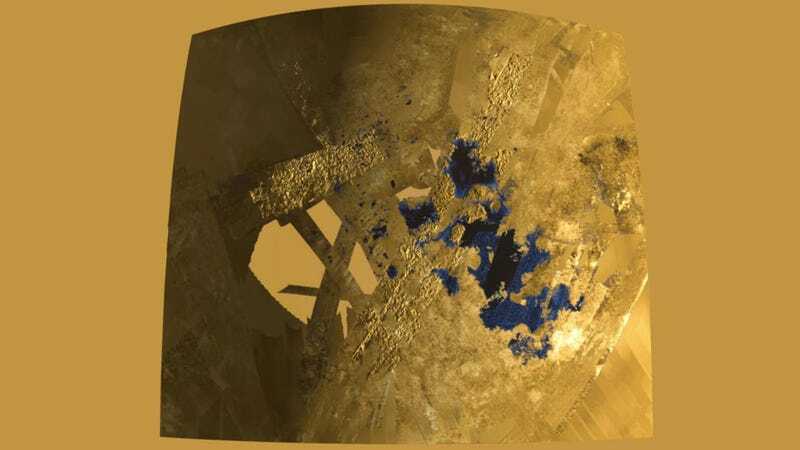 Smaller lakes appeared at heights several hundred feet higher than Titan’s sea, again approximating something we see on our planet. As an extreme example, Lake Titicaca sits 12,507 feet high in the Andes Mountains. “We’re measuring the elevation of a liquid surface on another body [930 million miles] away from the sun to an accuracy of roughly 40 centimetres [15.75 inches]. Because we have such amazing accuracy we were able to see that between these two seas the elevation varied smoothly about 11 metres [36 feet], relative to the centre of mass of Titan, consistent with the expected change in the gravitational potential,” said Hayes in a statement. By referring to Titan’s gravitational potential, Hayes is talking about differences in sea level elevation owing to the effects of gravity (gravity isn’t consistent across a large celestial body, due to differences in its mass and shape). The global differences in sea level variation, the new research shows, are within the expected bounds of the moon’s gravitational effects. This study shows that Titan’s large liquid bodies must be connected somehow. The most plausible explanation, say the researchers, is that they’re connected by underground aquifers, and not through channels or rivers on the surface. Titan’s hydrocarbons are likely flowing beneath the surface, similar to how water flows through underground porous rock or gravel on Earth—the result being that nearby lakes or seas share a common liquid level. Is China Really Planning to Destroy Space Junk With Lasers?